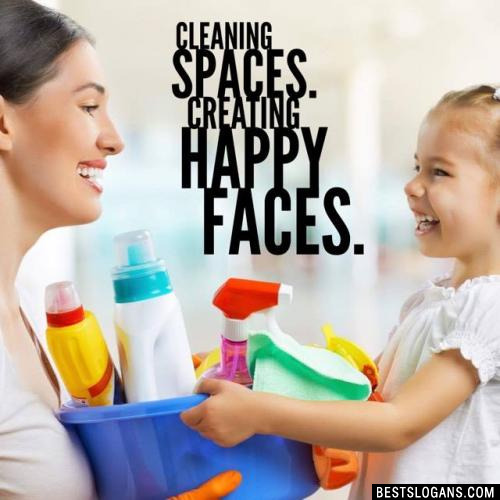 Collection of unique thoughts, slogans, taglines and ideas on cleanliness updated 2019. People rarely used soap to wash their bodies until the late 19th century. It was usually made from animal fats and ashes and was too harsh for bodies; the gentler alternative, made with olive oil, was too expensive for most people. The accumulated sweat, dirt and oil that a famous athlete or gladiator scraped off himself was sold to their fans in small vials. Roman women reportedly used it as a face cream. Teeth were cleaned in the middle ages and the Renaissance with green hazel twigs and woollen cloths. 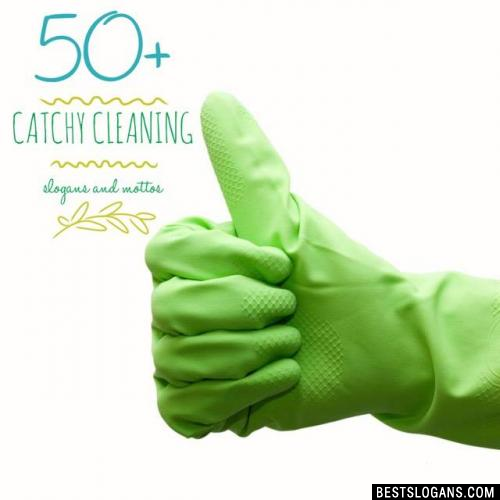 Good hygiene: We really appreciate the value of a clean and germ-free house. Yes, it isn't necessarily good to live in a clinically clean house because its harder to build up a resistance to bad bacteria BUT making sure your home doesn't need fumigating regularly is definitely a good idea! This is even more important if you have young kids. Think about the places they can reach and touch and how often they put their hands in their own mouths and eat food they've dropped on the floor Concentrate on the bathrooms and kitchens, the floors in particular, and make sure you get rid of waste and clean up anything that might grow mould! It makes you feel happy: It really, really does! Theres no better feeling than coming home to a really clean house, smelling the freshness as you walk in and seeing that everything is sparkling and in its place. Organization: Knowing where everything is speeds up every task you do! I can't sit down to do work at my computer or relax if there's a messy or dirty house around me. It really clears your head knowing everything is shipshape and also limits distractions. It helps your social life: You will want to show off your beautiful clean house, so you will be more likely to invite friends over, meaning you see them more! I bet you still can't help saying, "excuse the mess" before they walk in though, even if its not true. 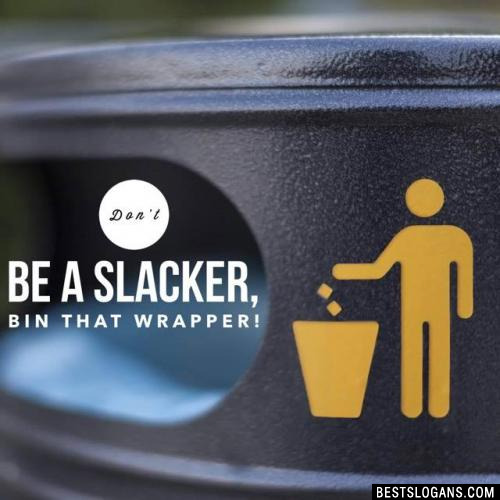 Don't be a slacker, bin that wrapper! 2 Be keen to keep it clean. 3 Experience a healthier, cleaner home. 4 Our reputation is spotless. 6 I clean the city. I green the city. 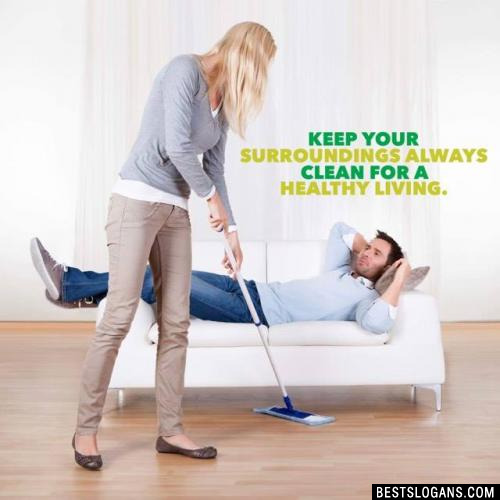 Keep your surroundings always clean for a healthy living. 8 Cleanliness is the half of the faith. 9 Please help keep the world clean: others may wish to use it. 10 Cleanliness is an emblem of purity of mind. 11 Being green is staying clean. 12 God Gave us Green now lets keep it clean! 13 Keep your city clean and green for the future generations to be seen. 14 Lit the lamp of cleanliness to spread the light of godliness. 15 Clean people and healthy people can make a wealthy country. 16 Cleanliness is the only medicine to all diseases. 17 Today is the best day to pledge for cleanliness. 18 No day is better than today to take the pledge of cleanliness. 19 Follow cleanliness to spread godliness! 20 Cleanliness is our fellow which keeps us away from sorrow. Can you think of a good Cleanliness Slogans we're missing? Or come up with a clever one of your own. Please share below.